Very few of us take such ideas seriously now. But Kennaway’s history shows how expert knowledge can change dramatically. Music, in our day, is generally regarded as at least medically harmless if not positively therapeutic, and things seems likely to stay that way. But what if a great reversal occurred not with respect to music, but with our view on literature? What if literature came to be known as a cause of illness—whether as a whole, or in particular genres, canons, and works? The question is a warning for those who are interested in how Scottish Literature might fit into ongoing research in both ‘literature and medicine’, and the ‘medical humanities’: one view amongst scholars is that we can and should inquire into the health-giving properties of literature. There are various motives behind this mode of inquiry, and its positioning of literature as ‘bibliotherapy’. Clearly one cannot discount the contemporary political and social scene. In the UK, as in many neoliberal economies, there has been a squeeze on humanities funding, and an expectation that the humanities justify their existence in terms of ‘impact’ upon society. Positive health outcomes from reading literature would be a very definite form of impact. Moreover, one can see how Scottish Literature in particular might make use of such leverage. If Scotland is the ‘sick man of Europe’ in terms of population health, Glasgow a particularly unhealthy city, and so on, then health-giving literature acquires an extra significance in our national context. But what would it really mean to investigate Scottish Literature for its health-giving properties? The complexities of how this might actually be done boggle the mind. But leave aside the nitty-gritty of the how, and think about the potential results, and one in particular. What if it turned out that Scottish Literature was bad for you? Consider the following extrapolation. If it’s good to read literature because reading literature is (hypothetically) good for your health, then, by extension, the most valuable works of literature are those that are best for your health. On the other hand, the least valuable are those that are identifiably injurious to health. So imagine that reading A.L. Kennedy turns out to be bad for your health. By this I mean that reading Kennedy’s work has been specifically identified as ‘pathogenic’. It’s not because you tend to sit down to read (and so get less exercise, or damage your posture), or because of some other confounding factor, that Kennedy is bad for you. Rather, reading Kennedy’s work is, in itself, bad for your health. Let’s say that it promotes anxiety, depression, insomnia, and (psychosomatic) irritable bowel syndrome. Now imagine that reading Alexander McCall Smith’s work turns out to be good for you. 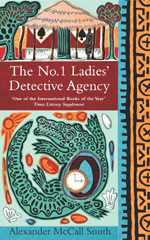 On the whole (and let’s say in comparison to a non-reading control group), those who take a regular dose of the No 1 Ladies’ Detective Agency, turn out to be calmer, happier, sleep better, and to have more orderly bowels. McCall Smith’s work is thus better, more valuable, from a health-giving point of view, than A.L. Kennedy’s. We can imagine other potential experimental discoveries of literary pathogenesis. Perhaps Literature in English from England turns out to be generally health-giving, and Scottish Literature to be generally pathogenic. One might then need to discourage the advertising of Scottish Literature, its consumption in public places, and its sale to under-16s. It would be advisable that Scottish Literature be consumed only by specialists who have taken prophylactic measures (anti-depressants, tranquillisers, peppermint tea). Moreover, just as we have evidence-based medicine (EBM), so we can develop an evidence-based canon (EBC). Literary critics can give up squabbling about the value of books, for their judgements and arguments are not really judgement and arguments at all, but are at best pre-experimental hypotheses (equivalent to ‘anecdotal evidence’). Further refinements will no doubt be conceivable: a personalized regime of literature, on an analogy with personalized medicine, might seem a logical next step. At this point, the reader sympathetic to the idea of Scottish Literature as health intervention may well retort that my extrapolations are extreme and absurd. Perhaps they are. But my point is that a genuine investigation would have to be consistent in its response no matter what the results. Were literature to be investigated and valued for its possible health-giving properties, then literature would have to be devalued where it turns out to be pathogenic. However—I suspect—such a practical corollary seems quite absurd. No one would be minded to take Kennedy off the canon of contemporary Scottish Literature, and substitute McCall Smith, for reasons such as those imagined above. What, then, is going in the apparently plausible idea that we could investigate Scottish Literature for its health benefits? Clearly, to neglect the possibility of literary pathogenesis, and its ramifications, is to conspire with a middle-brow reading culture. Readers read, it might be supposed, because it makes them feel good, and this feeling good is probably a sign that their health and wellbeing has been improved—a view plausible if your idea of a literary text is something by McCall Smith rather than Kennedy. Yet it’s far from implausible that reading challenging literature might actually give us sleepless nights, make us more worried, sadden us—maybe even hit us at a gut level. Good books might, in other words, actually be pathogenic. Complacency about the nature of literary value leads to an assumption of predetermined harmony between aesthetics and therapeutics: good art equals health-giving art. But there is also something in our contemporary ideas about value that make it hard to imagine a pathogenic literature. There is a problematic tendency to conceive of health as not just the absence of illness, but rather as a positive state of wellbeing, happiness, and flourishing. So if we are in little doubt that literature is a good, then we may well suppose that its goodness lies in its contribution to such a condition. But within the continuous and extendable concept of health-wellbeing-flourishing, all kinds of goods can be captured, including whatever we value in the reading of literature. Practically any response can be regarded as confirming the hypothesis that Scottish Literature is good for you. Health, wellbeing and flourishing make up an elastic measuring tape. Certainly there are naive and hedonistic measures. How cheerful do you feel? Do you have energy to spare? But there are a plethora of competing measures and conceptualizations (which partly explains the existence of the Journal of Happiness Studies). Even where a work of literature didn’t promote good mood, or a sense of self-actualization, we could very likely still view it as promoting wellbeing, happiness, and flourishing under some measure or another. Even suffering can promote happiness and well-being when the world’s wisdom traditions are grafted into our ethical discourse. As one commentator in the Journal of Happiness Studies remarks, ‘Happiness understood in the Buddhist way is not necessarily incompatible with suffering, sadness, and tragedy’,4 while ‘Sufis embrace hardship and suffering as necessary elements of the path towards God’.5 Because of such diverse elements within expert ideas, it is almost a prior assumption that even challenging literature—the stuff that may lead to sleepless nights and guilt or sadness—will in some sense contribute to that nebulous conjunction, wellbeing-happiness-flourishing. The assimilation of questions of the good life to questions of the healthy life is yet one more indication that we live in a period in which medicalization has run amok. The clinical vocabulary with which we now approach even the deepest issues of moral and ethical life are simply one part of a growing tendency to conceive of human difficulties as fundamentally medical. From male baldness to gun crime, the medical view of the world has gained a wider and wider cultural authority. The ingenious device of viewing Scottish Literature as if it were a health intervention might help to ensure continued funding streams for the study of literature and medicine (in some sense of the word ‘study’), but surely there are other, better paths for Scottish literary criticism (and literary writing) to follow. A number of them are doubtless apparent in this issue of The Bottle Imp, and many more will emerge in the work of talented doctoral and postdoctoral researchers. But, in my view, it is imperative that current and future research should resist the temptation to conceive of Scottish Literature as a health intervention. James Kennaway, Bad Vibrations: The History of the Idea of Music as a Cause of Disease (Farnham, Surrey: Ashgate, 2012), p.1. Mohsen Joshanloo, ‘Eastern Conceptualizations of Happiness: Fundamental Differences with Western Views’, in Journal of Happiness Studies, 15 (2014), pp.475-93 (p.479).